The runner-up for the most conjunctions in Aquarius was 0–500 CE, with 6. This time roughly spans the period of the rise, dominance and fall of another highly sophisticated technological civilisation already mentioned: the Roman Empire. And the 500 years with the fewest Aquarian conjunctions? There was only one Jupiter/Uranus conjunction in Aquarius from 1000 to 1499 CE, roughly spanning the time known as the Dark Ages in Europe, which included the Black Death which wiped out a third of the population in the fourteenth century. Perhaps rather worryingly, in the three millennia I surveyed the only other period with one Jupiter/Uranus conjunction in Aquarius lies ahead – between 2000 and 2500 CE at 2 degrees Aquarius in 2080. This is the last of these Aquarian conjunctions for another 677 years. Ever since doing the intriguing research briefly described above, I have been reflecting on what the symbolism may be telling us as a human community. Then from the summer of 2009 I began writing what has turned out to be a series of articles, and a research project asking for accounts of the experiences of 10 volunteers “plugged-in” to the three conjunctions at 0 degrees 18 Aries on 8 June 2010, 28 degrees 43 Pisces on 19th September 2010, and 27 degrees 02 Pisces on 4 January 2011. One day a few months ago, I happened to return to Michelsen’s “Tables of Planetary Phenomena” to indulge my curiosity regarding the historical pulse beat of Jupiter/Uranus conjunctions in Aries and Pisces. I had been reflecting on the contradiction inherent in the conjunction’s first pass at 0 degrees Aries, a point of huge power and surging cardinal force, followed by its slide backwards into the deeply mysterious, diffuse Piscean tides. Aries, the dynamic beginning of the cycle of life: Pisces, the ending – great dissolver of all earthly action back into the great Universal, the Void, the Quantum Vacuum, God, Allah, Krishna, the Goddess, the Divine……what does this contradiction mean, in essence? This entry was posted in Astrology Article Archive 4 – Spring Equinox 2011 and the Big Picture and tagged "as above so below", Anne Whitaker, “Jupiter Meets Uranus”, Dark Ages in Europe, Jupiter/Uranus conjunction 2010/11, Jupiter/Uranus conjunctions in Aries and Pisces, Jupiter/Uranus in Aries, Michelsen’s “Tables of Planetary Phenomena”, mundane astrology, The Aries point, The Big Picture, the Black Death, the cycle of life, the Quantum Vacuum, the Roman Empire, the Void. Bookmark the permalink. I enjoy your writing and find your research fascinating. 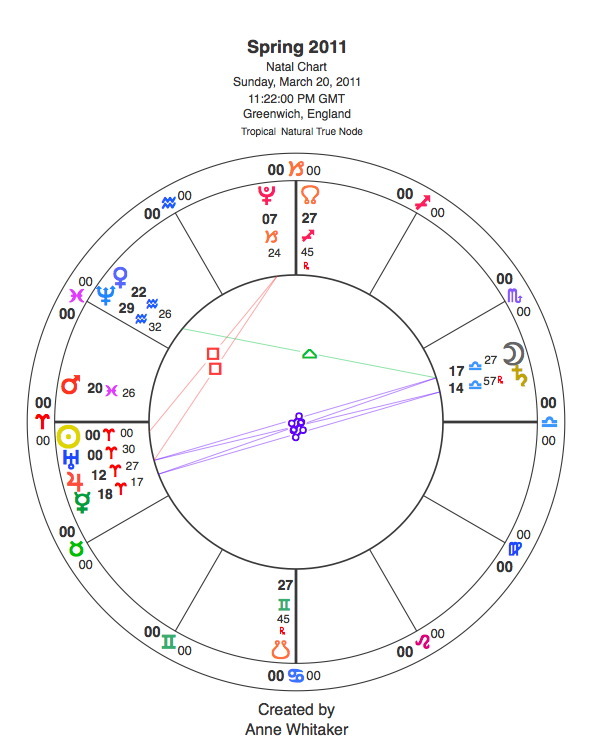 The Jupiter / Uranus conjunction in Aquarius in 1997 conjuncted my Moon; then the Jupiter/ Uranus conjunction in Aries in 2010 conjuncted my Mercury. Both my Moon and Mercury are part of a yod, so these transits have reflected positive changes in my life! thank you for your positive comments – yes, this kind of research IS fascinating and could be done on any planetary duo with a copy of Michelsen’s “Tables of Planetary Phenomena”. I had thought of doing a further research study on Saturn/Pluto conjunctions, since I have that cheerful duo conjunct my Mercury. But I concluded that it would be too hard going! Thanks also for your personal feedback. And do keep following – only three more installments to go! I really liked this piece of research. When were the conjunctions at 0º Aries in the past millenia? Only around 588? I found quite interesting that the Roman Empire felt in 476 and then over 100 years, most world civilizations were fragmented. In 632, Islam began. We have had all the big empires from the past dividing as well, the British Empire, the Soviet Union. Maybe this will be a return to localism, to local living instead of a world focus? Or maybe a move away from the agressive and dominating energy of Aries, a lack of a world leader? You really should acquire a copy of Michelsen’s “Planetary Phenomena” – it’s the one book I would take to a desert island! And thanks for dropping by….